Background: Pancreatic cancer carries a poor prognosis. To date, there has been little research devoted to decision-making regarding treatment options in pancreatic cancer, including the rationale for choosing to withhold tumor targeting treatment (TTT). This study aims to gain insight into the characteristics of patients receiving no TTT, the reasons for this decision and their survival. 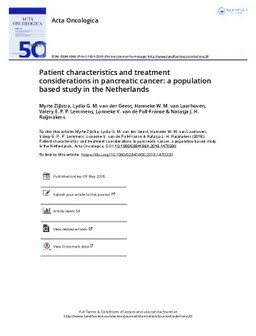 Methods: All patients diagnosed in the Netherlands between 1 January 2014 and 30 June 2015 with a proven pancreatic adenocarcinoma or a pathologically unverified pancreatic tumor were identified in the Netherlands Cancer Registry. Information on initial management, patient characteristics, main reasons for no TTT (as reported in medical charts) and survival were analyzed. Results: A total of 3090 patients was included. Of these patients, 1818 (59%) received no TTT. Median age of no TTT patients was 74 years (range 35–99) versus 66 years (30–87) for TTT patients. In the no TTT group 77% had a clinical stage III/IV versus 57% of patients who received TTT. Main reasons for not starting TTT were patient’s choice (27%) and extensive disease (21%). Median survival of patients who did not receive TTT was 1.9 months, ranging from a median survival of 0.8 months (when main reason to withhold TTT was short life expectancy) to 4.4 months (main reason to withhold TTT: old age). In the latter group, a relatively large proportion of clinical stage I tumors was present (37%). Conclusion: The majority of patients with pancreatic cancer received no TTT and had a very poor median survival. In most patients, patient’s choice not to start treatment was the main reason for withholding treatment, suggesting patient’s involvement in decision-making.